Art Papazyan and Pete Chen had tremendous success in Season 16 of the WPT. The World Poker Tour Tournament of Champions winds down to a final table, and the end of the WPT season is in view. That means the season-long points races have come to a close, and Art Papazyan and Pete Chen earned top honors on a couple of leaderboards. The elimination of Joe McKeehen in third place at the Bobby Baldwin Classic meant Papazyan locked up Season 16 WPT Player of the Year. Papazyan had to endure quite a sweat, as McKeehen got it in there good with a dominating ace-queen against the ace-two of Darren Elias, but a deuce arrived on the flop and to fell McKeehen. The former WSOP Main Event champ racked up seven cashes and three final tables this season — both marks leading all players — but finished fourth in the WPT Borgata Winter Poker Open and third in WPT Rolling Thunder and the Bobby Baldwin Classic. If he had laddered up one more spot in any of those events, he'd have tied Papazyan for the lead. In the end, Papazyan's two victories — he shipped WPT Legends of Poker and then won WPT Maryland Live! a month later — proved to be just enough. Papazyan told PokerNews he wasn't planning to points chase at all even after his first win. Mainly an online player who dabbles in live cash games, he admitted he basically claimed the prestigious POY win on accident. "It's really nice," he said. "I wasn't planning on playing more tournaments. I'll have to play more because of the perks that come with winning player of the year." Indeed, Papazyan will have his expenses burden considerably eased at any stops he wishes to attend next season. The WPT will put him up with complimentary accommodation and ground transportation to any events he decides to play. Plus, he earned a WPT-branded Hublot Big Bang Unico Limited Edition watch. The poker-themed timepiece is valued at over $24,000. 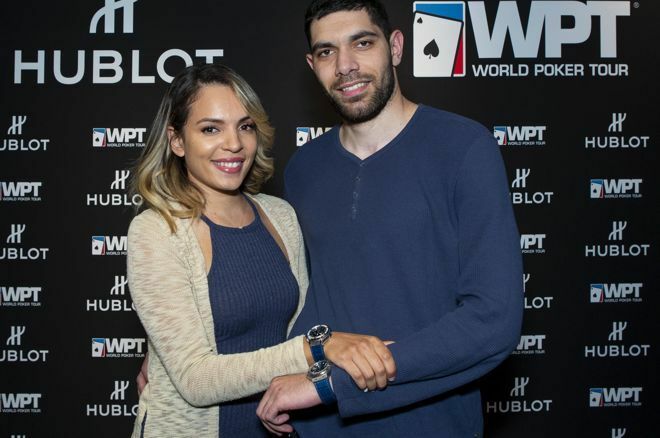 He may have stumbled into a couple of WPT titles, but poker fans can expect to see more of Papazyan on the tour next season. "Hopefully, I can continue to run good and have success," he said. Though it took place way back in April 2017, Pete Chen won WPT Beijing in the very first event of the season. He nabbed three more cashes in WPT Korea and WPT India side events, and that was enough to secure him WPT Asia-Pacific Player of the Year honors. 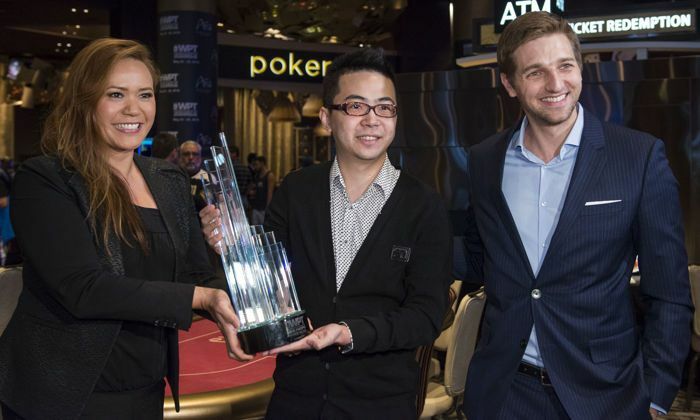 Chen receives his trophy from the WPT's Angelica Hael and Tony Dunst. The points race was comprised of the aforementioned events, as well as WPT Japan and WPT Sanya. "I'm happy but it's not a big competition," Chen admitted on break at the Tournament of Champions late on Day 1. While the scale of the POY race may have been small, Chen earned quite a handsome prize: a $15,000 package good for any WPT events in the region. He'll also get complimentary accommodation and ground transportation for said events. The win is definitely in character for Chen. He's widely known for the insane volume he puts in. He estimates he plays about 300 tournaments per year, piling up stacks and stacks of receipts for his social media followers. All that volume means Chen is no stranger to topping POY leaderboards. In 2014, he took down PokerStars Asia Player of the Year honors. "I want to be a really good player," Chen said. "I want to be something special." Unfortunately for Chen, the future of poker in the region has become a bit cloudy. The so-called "Chinese Black Friday" has resulted in room closures in Macau, where Chen is based. It remains to be seen how the WPT will navigate those murky waters for upcoming seasons. "They're trying to make money," Chen said of the casinos. "I hope it will get better." For now, Chen is focused on more leaderboard goals. He's nearing the top spot in Global Poker Index Asia rankings and said he hopes to reach the overall top 10. That's tough to do without playing high rollers, but Chen uses responsible bankroll management so he's sticking to more affordable tournaments for now. This summer, he's playing a full WSOP schedule and plans to dabble in non-hold'em events for the first time. He's eyeing the low buy-in 8-game variants. Chen may not be an expert, but he said if he gets lucky early on, he's going to aim high. "If I get lucky and bink something, my goal will be WSOP Player of the Year," he said. "I think you should always have a goal that's not easy to get."